If you have not yet seen the movie Slumdog Millionaire, you’ve surely heard of it. One of the biggest movies of the year, it just swept the Golden Globes and looks poised to do the same at the Oscars. For good reason – it’s affecting without being affected, gives us great multi-dimensional characters, has phenomenal cinematography with brilliant India as its backdrop, along with a beautiful musical score. In addition, it has three of the most natural, appealing child actors to be seen on the big screen in a long time. If you haven’t seen the movie, I urge you to see it. I promise it’ll take you an hour after the ending to wipe the smile off your face. This tale of life and love in the slums of Mumbai alternates between heartbreak and triumph. The story follows two brothers who live in abject poverty, whose lives are made even more difficult after they are orphaned. Following them throughout their childhood and into early adulthood – along with their friend Latika – we see them fight against exploiters, brothel owners, child abusers, and even each other, in their struggle to survive. I spent a day as an “Un-Tourist” in these very slums of Mumbai – a place called Dharavi. I went with Deepa Krishnan, owner of tour operator Mumbai Magic. Immersing yourself in the real lives of ordinary people in a place traveled to is a unique experience, and one that can truly bring the spirit and culture of a place alive to the traveler. Slumdog Millionaire captures this brilliantly and is a fantastic movie, that caused me at times to want to applaud and at times to cringe and shut my eyes. Despite its upbeat ending and “rags to riches” Hollywood/Bollywood mechanism, Slumdog Millionaire shows us a side of India, and a way of life, that millions of children struggle to survive every day. Orphaning, abandonment, homelessness, begging, working, being exploited and abused…this is real, daily life for hundreds of thousands of children in Mumbai alone. The actors who play the characters at their youngest ages are themselves Hindi-speaking street kids, discovered by casting director Loveleen Tandan. This fact reminded me of the 1988 movie Salaam Bombay, a movie by Mira Nair that was also about street kids in Mumbai, and which featured a cast of actual street children. Nair went on to start a foundation, the Salaam Baalak Trust, with proceeds from the film, and today SBT assists thousands of street children in Mumbai and Delhi. I interviewed Nair’s mother, Praveen, in my book The Weight of Silence; Praveen started SBT with her daughter Mira. Salaam Bombay has a grittier, more realistic feel without the rags-to-riches ending. While I love the Slumdog Millionaire movie, while watching it there did resonate in me a sense of reinforcement of just such fantasies that lead kids into street life in Mumbai all the time. 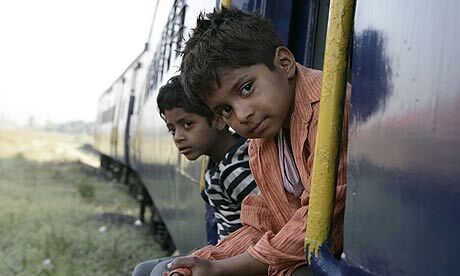 While traveling India and researching for my book, I interviewed many social workers and child advocates who told me that thousands of children run away from home and catch a train to “Bombay” with fantasies of the movies or making it big in the glamorous city filling their head. Sadly, most of them fall prey to just such exploiters as those found in both these movies: traffickers, begging rings, brothel owners or factory recruiters. Many of them remain living in the railway stations in which they arrive, begging or scratching out a living by sorting through trash for recycling or other dangerous endeavors. You can read my story here about my day spent with just such railway boys in Mumbai. The lesson I would like to leave about this movie is: please see it. Enjoy it. Revel with these kids when luck comes there way. But please, please – don’t forget the millions of others whose lives continue in poverty, abuse and despair. ← January 19, 2009: A Call to Serve! I saw Slumdog Millionaire today. Boyle has really done a good job with this movie. While the movie deals with the gory details of the underbelly of Mumbai, it doesnt really leave you with a sick feeling. The story feels like a commentary and at the end you just feel good about the whole movie. Very well done I must say.